Five poems (quintet), Walters Art Museum, Ms. W.624, fol.58a, originally uploaded by Walters Art Museum Illuminated Manuscripts. This is a deluxe copy of the Quintet (Khamsah) of Amīr Khusraw Dihlavī (d.725 AH /1325 CE). Although now incomplete, this manuscript was penned in nastaʿlīq script by the famous late 16th century Mughal calligrapher Muḥammad Ḥusayn Zarrīn Qalam al-Kashmīrī and decorated by a number of illuminators and painters. Its illustrations are signed by eleven painters: Laʿl (Lāl), Manūhar, Sānwalah, Farrukh, Alīqulī, Dharamdās, Narsing, Jagannāth, Miskīnā, Mukund, and Sūrdās Gujarātī. On the other hand, its headpieces and a medallion are inscribed with the names of Ḥusayn Naqqāsh, Manṣūr Naqqāsh, Khvājah Jān Shīrāzī, and Luṭf Allāh Muẕahhib. The codex has beautifully decorated borders with vegetal, bird, animal motifs and human figures. The figures are portrayed in various traditional activities such as praying, reading and hunting. 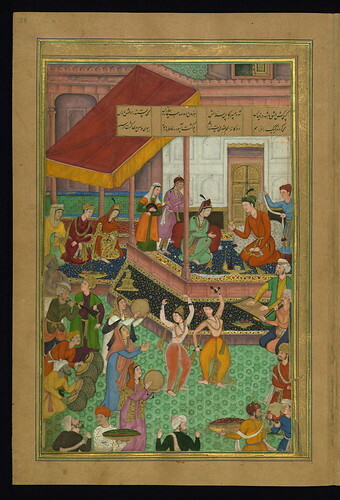 Khusraw and Shīrīn preside over the wedding of youths.